Remember this idea I referred to last Mother’s Day? I had first seen it on Pinterest, and then tracked it back to this blog. 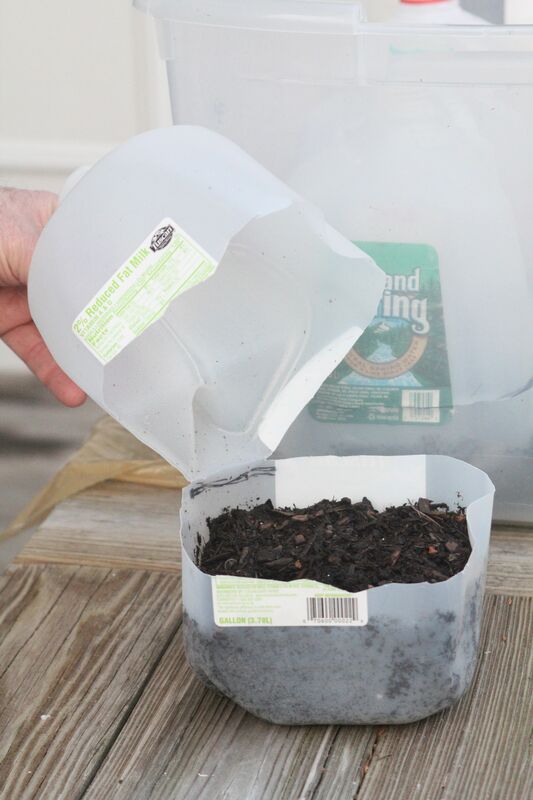 In general, Kevin Lee Jacobs describes creating miniature greenhouses in reused plastic milk jugs. He also attributes the idea back to Trudi Davidoff. Thanks, Kevin! We started saving our gallon milk jugs in the fall. It seems we’re always nearly out of milk, so I was really surprised that it took several months to accumulate 24 jugs. When they were emptied, we rinsed them out so as not to be too heinous-smelling come winter. Using Kevin’s directions, we cut them in half with a knife (kind of time consuming), leaving about 1″ hinge. KP used a drill to create the drainage holes in the jugs. We then used big tubs and put drainage holes in those too. Recycled jugs for winter sowing. 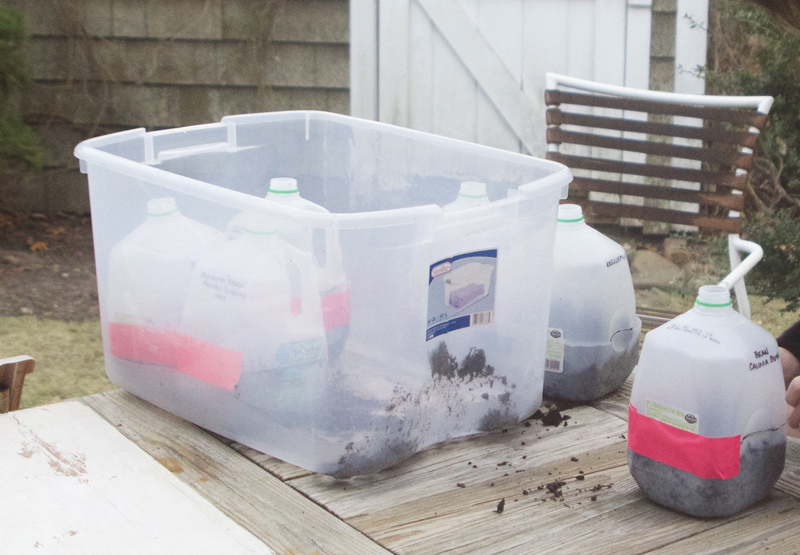 I filled each with 3-4 inches of seed-starting soil, and then sprinkled a healthy amount of seed into each little bed. After covering the seed with about another inch of soil and dampening with water, I quickly (!) labeled each one with the plant, species, and date of planting. 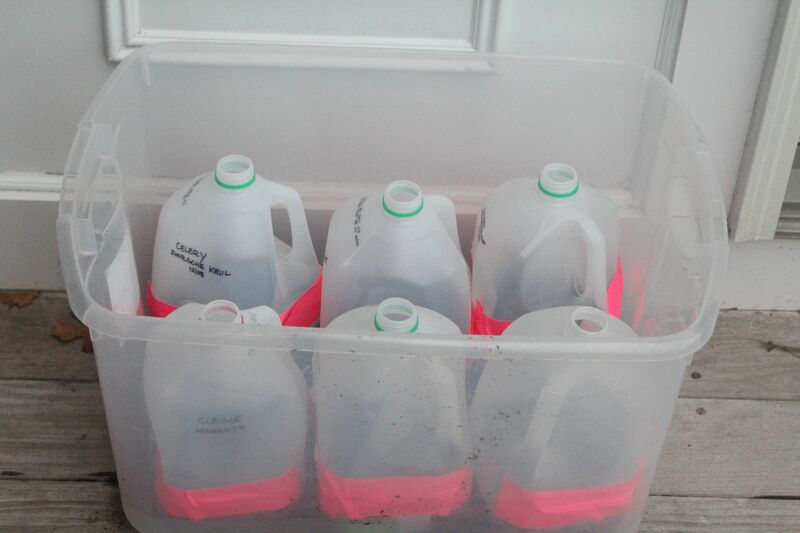 For the first batch – 12 jugs, I used 3 different kinds of celery (from Rare Seeds), two colors of cleome (collected from the uni), white nicotiana (seed from Lynch’s), two kinds of beans (leftover from the summer’s failure planting), and asclepsia collected from my garden. KP was most assured that we didn’t need to duct tape them as Kevin had instructed. Since we didn’t have any duct tape on hand, I went a long with it :). Wouldn’t you know those damn raccoon varmints got in the seed and just mucked things up! Needless to say, there were beans all over the deck and in the asclpsia jug, and dirt every-where. I should know better! Remember this? So, then we went to get duct tape. All that was available at the grocery store was day-glo PINK. See all the dirt mess inside the tub? 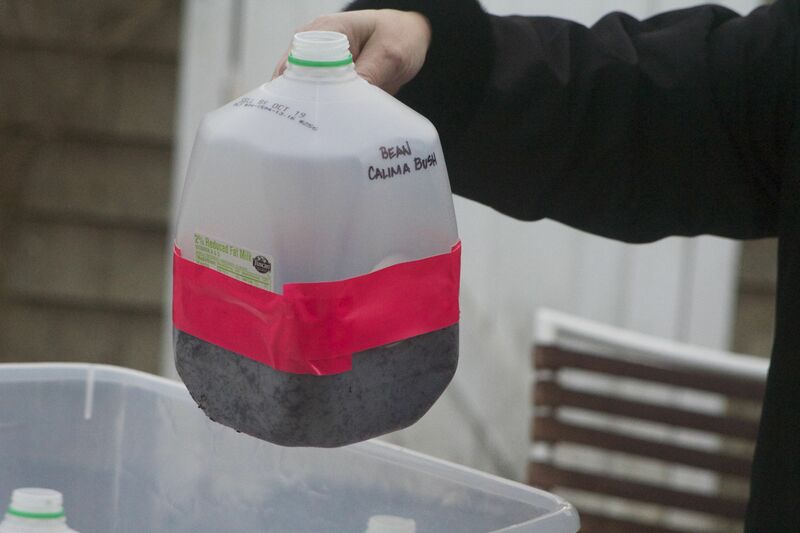 Amazingly, as soon as the jugs were taped, I could FEEL the temperature difference between the air outside the jug compared to the air inside the jug! …and here they are, all “varmint-proofed”. Twelve jugs are starting, and when I’m back at the garden, I’ve got at least 12 more ready to go! 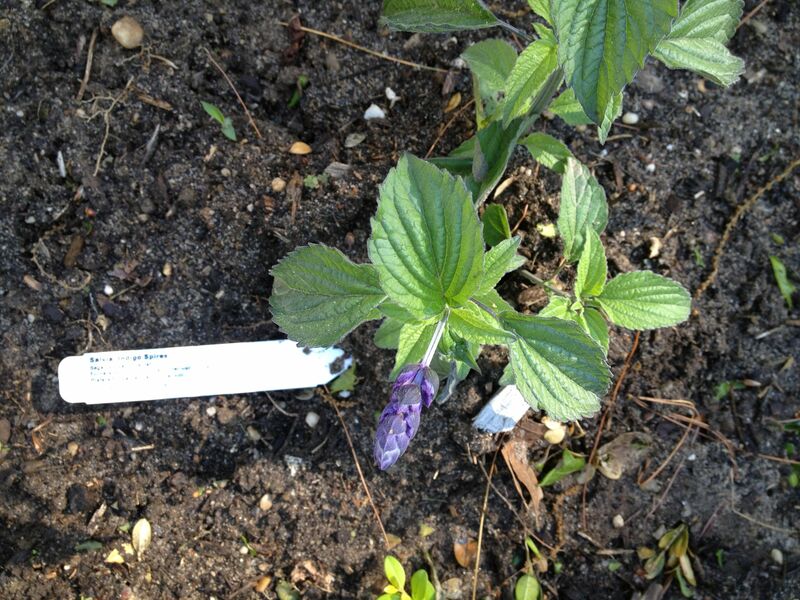 …very exciting and I have visions of sharing lots of baby plants in the early spring. And so it is the happiest moment when the beds are put to sleep. Richly productive manure wraps each bed in a protective, nutritious layer. Thanks to Jerry and Gail at North Shore Equestrian Center for the black gold! Goal 1: creating a stronger visual barrier between the quad and the fence on the south side of the quadrant. Before view of the south perimeter. (look past the lovely Crocosmia and red tomato cages, dear Reader!) Work here was tough. Both KP and I were stung by nettles that had sprouted there! Ouch, ouch baby. Not only was it treacherous, but it was also major ugly. It resulted in uninspired photography. 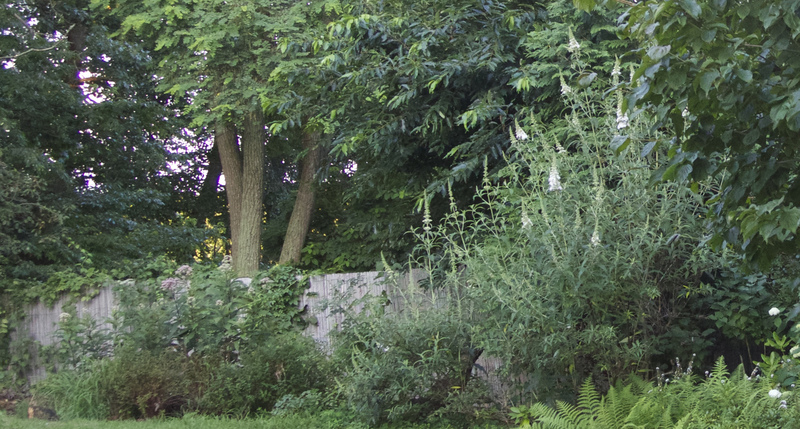 Here is one distant capture of the area with joe pye weed and hypericum. With the close of the season, though, KP got a yen to clean out some vines and pesky locusts. Look forward to next season when I can fill in even more desired plantings that aren’t too tall. We want to preserve the view across the channel in hopes of having a viewing platform. Or, since it’s all fantastical at this point, a hot tub. Goal 2: creating sequential and continual interest throughout the summer. This year was better than previous. 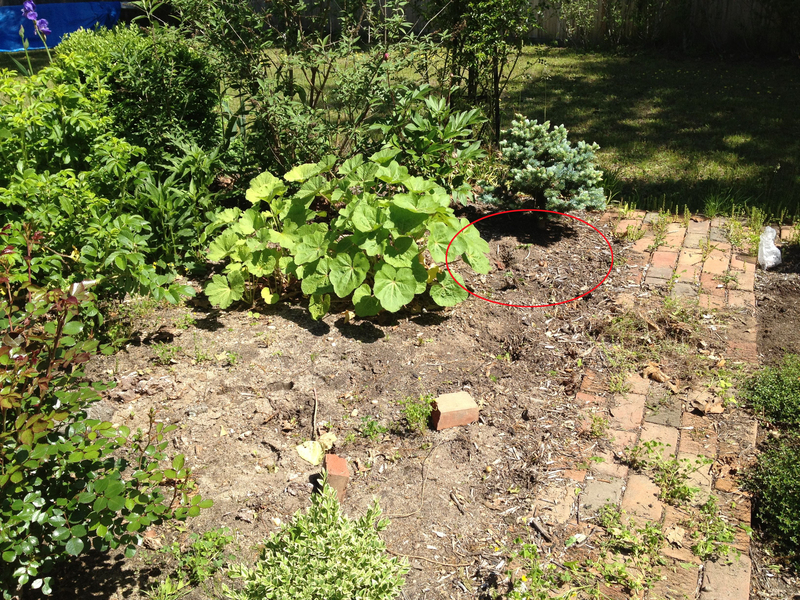 I believe the antidote was cutting some stuff back after blooming and filling in with later blooming annuals. 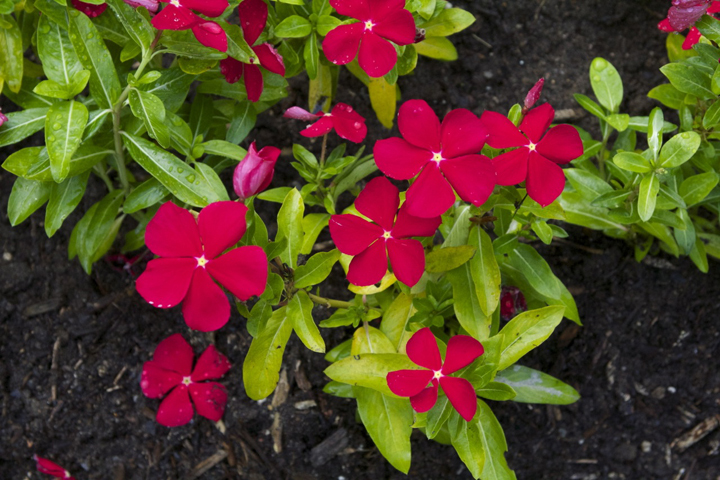 Of particular note, loved the Catharanthus roseus (aka Vinca) so I must be sure to look for it next season. The two versions of Caladium were absolutely awesome and 100% worth the few bucks HD charged. Here’s one version (left). These dahlia (right) I picked up from the local nursery, also from a bag, were awesome. No idea (unfortunately) as to the varietal name. The photo on the package also indicated this was more of an orange-ish red, but grew to be a brilliant brick red. Goal 3: I wanted to do less maintenance along the perimeter and front of house; move detail work to quad so that more of my time and attention is focused on plant maintenance in the quad. The outcome? I did less in those peripheral areas, simply because I didn’t have the time or energy. Essentially, I just ignored them. But with guilt. 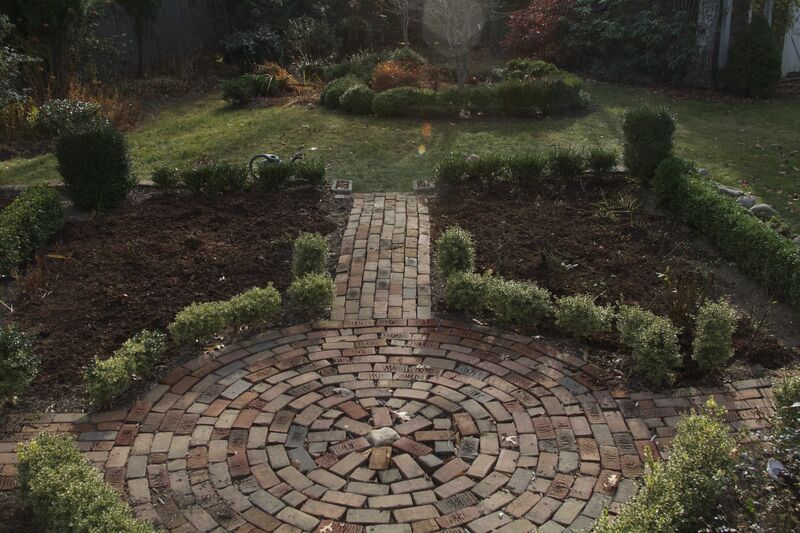 Some unseasonable weather had given me two sunny days in the 50s so I was able to rake and tidy the nautilus and the south border bed. What didn’t do so well ? The anemone didn’t do so well, but that may be because it is year 1. The purple “Mr. Fokker” came up white. Hope springs eternal for better blooms next season! One practice I don’t want to repeat for next season is salvia in the quandrant. I edged the southern end of the quadrant with this tall beauty. You may recall the tiny babies (left) that grew huge and attracted many bees. It was a bit intimidating to walk through the gauntlet of nectar-collecting bees! No one was stung, but the size and magnitude of the salvia probably contributed to the tomato delay. 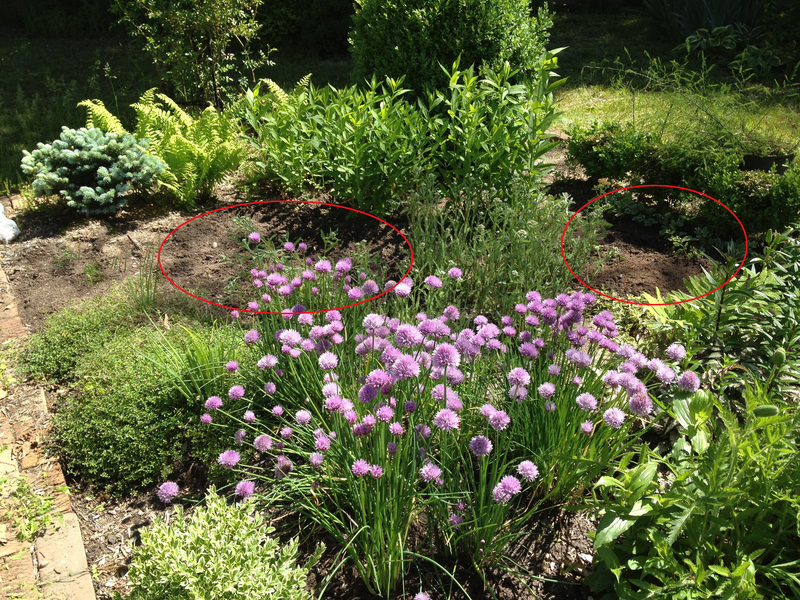 Since the picture on the right, I’ve cut them back and mulched them. If any of the plants overwinter, I’ll move them to the perimeter. In mid May, I sowed directly two varieties of carrots and beans around a configured repurposed trellis. The beans were failures. Only one trailer ever reached the top of the trellis and bloomed. The carrots didn’t need the shaded, protected area I created by the lean-to’s. 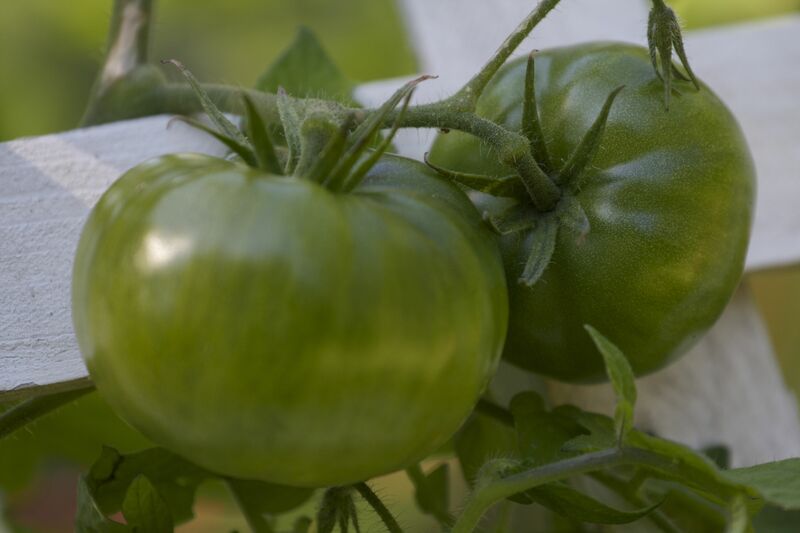 They too (like the tomatoes) didn’t produce fruit until late September. The Atomic red’s were somewhat disappointing but the Amarillo yellow’s were quite profuse. As directed on the seed packet, I planted a smattering late in the summer. I’ll check to see if they’ve matured and been fruitful when we’re back in Southampton. 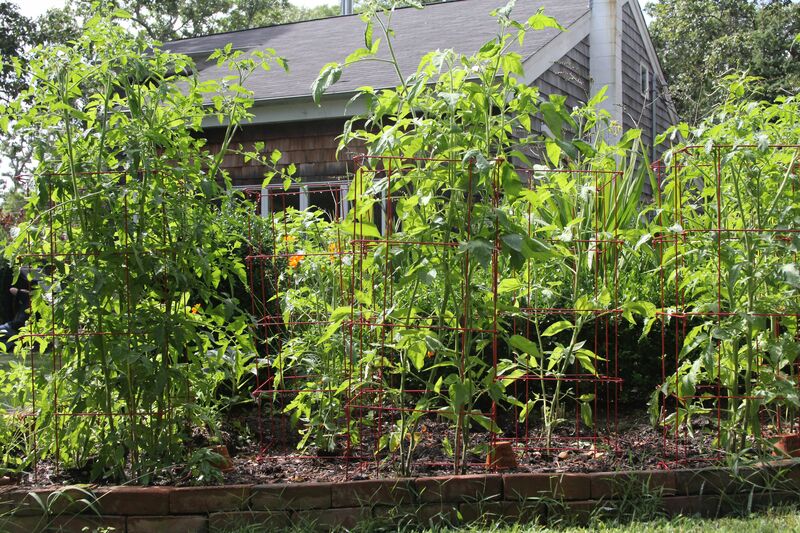 P.S… The tomato cages from Gardener.com lived up to their advertising. I didn’t have to tie any plants to the cages, and they cleaned up so nicely at the end of the season. Easy squeezy. 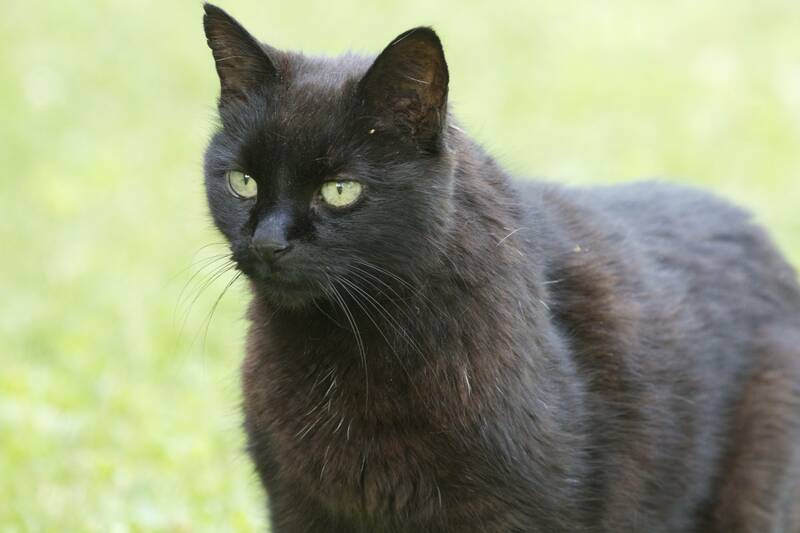 We had thought this visitor was Shadow kitty, introduced here. The story is a bit sadder, I’m afraid. When trailerman moved, I suppose he couldn’t capture the poor soul and so left him behind, explaining why the cat looked scrappy and was always hungry. I named him Foo Man a long time ago. While we were here full-time, this cat would hang out in the garden and seemed to have a Chinese-style beard that hung low. What I didn’t know then that we have since figured out is that Foo Man is deaf, the poor soul. We learned this by noting we could walk up on him while he was sleeping, making all kinds of noise on the approach. To wake him so he would move before being sprinkled or tossed off a cushion, I would touch him which would cause him to bolt several feet up in the air. 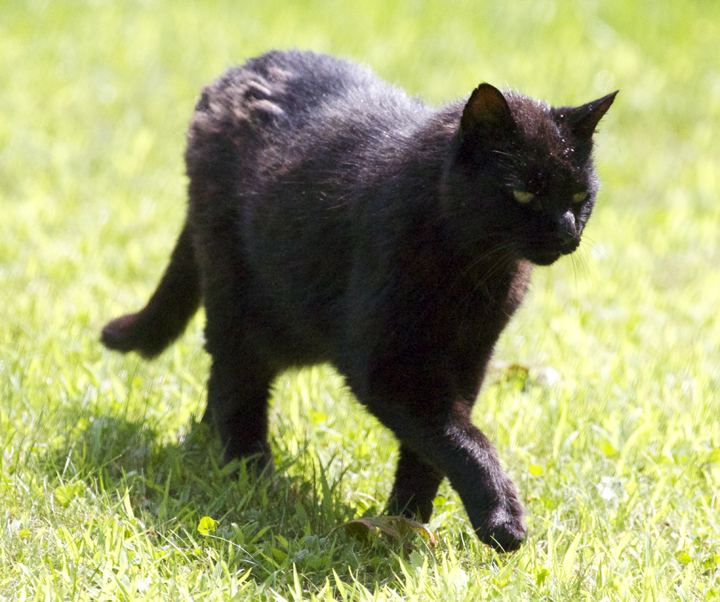 Then we really started observing him, noting that while at rest, his ears do not move like cats’ ears tend to do while resting: twitching and moving in micro-directions as they track various sounds. I also began to notice he doesn’t pick up on KP’s approach until he sees him. Not our noisy back door nor our awkward human steps alert him, but rather he takes note by sight only. My son picked this plant for me one mother’s day. Perfectly named for him during his early teen years (Lucifer), wasn’t quite sure what to expect as it was early in the season and the plant had not yet bloomed. But when it did, I fell in love. 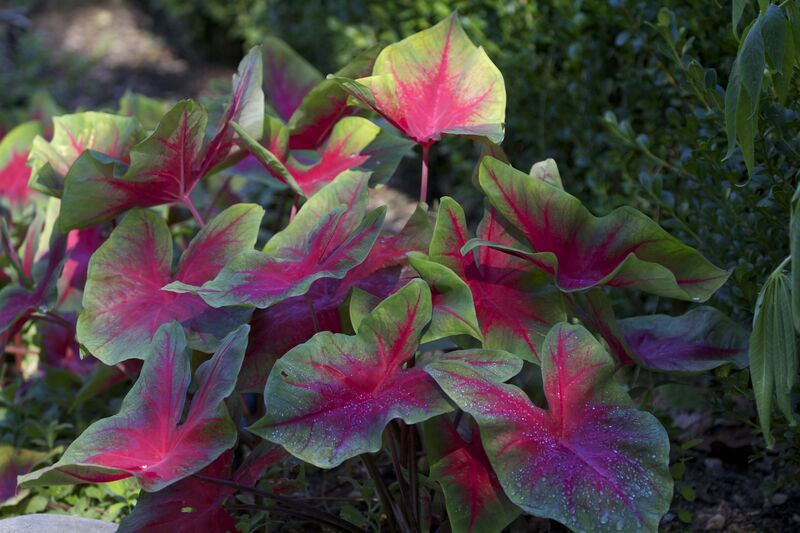 This plant is so exotic and tropical looking, but it is perennial in this zone (zone 7ish). Hummingbirds LOVE this plant and so I’ve moved it several times to allow for them to visit and suckle from a vantage point we can watch without interference. 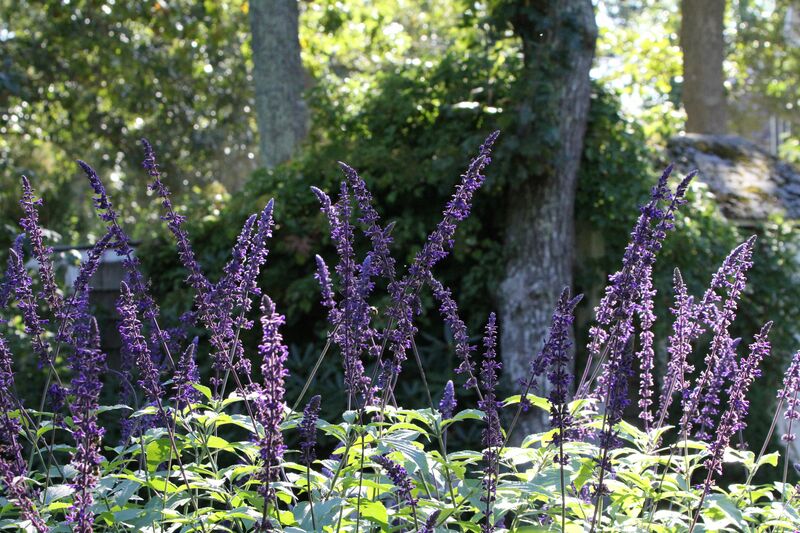 The plants are quite stately and do not require staking. Even after the blooms fade, the seed pods are architecturally interesting and stay strong from weeks afterward. Before the end of August, I will cut them back at the soil level, just to give other bloomers more space. 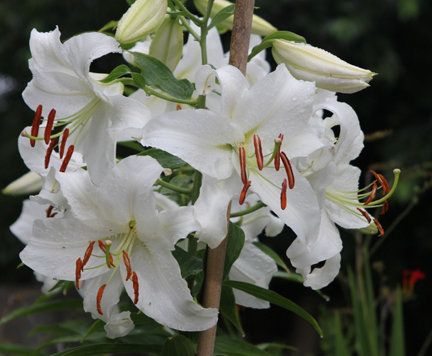 …and I didn’t know until this post that this species is part of the oriental lilies, like “Stargazer”. I always assumed it was part of the Hemerocallis family – a style of lily I always thought I preferred. These show girls bloom every year in the last couple weeks of July, serenading quadrant parties with their fragrant wafts of perfume. Some find the fragrance cloying, but then again they’re not in the quadrant! 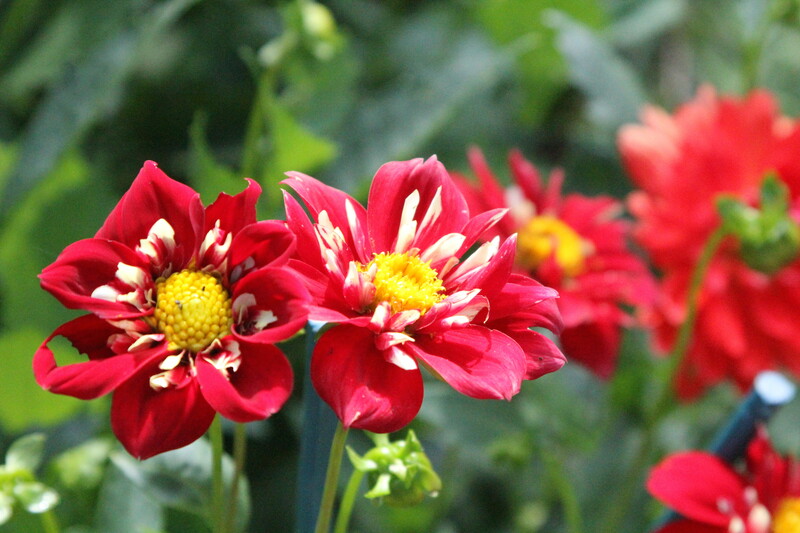 Mid-summer is also a time when holes start appearing in the garden, hence the red dahlia. Behind it, I’ve since planted a deep purple “dinner plate” dahlia, which I’ll show you when it starts taking off. Absolutely love the little white eye in the center. 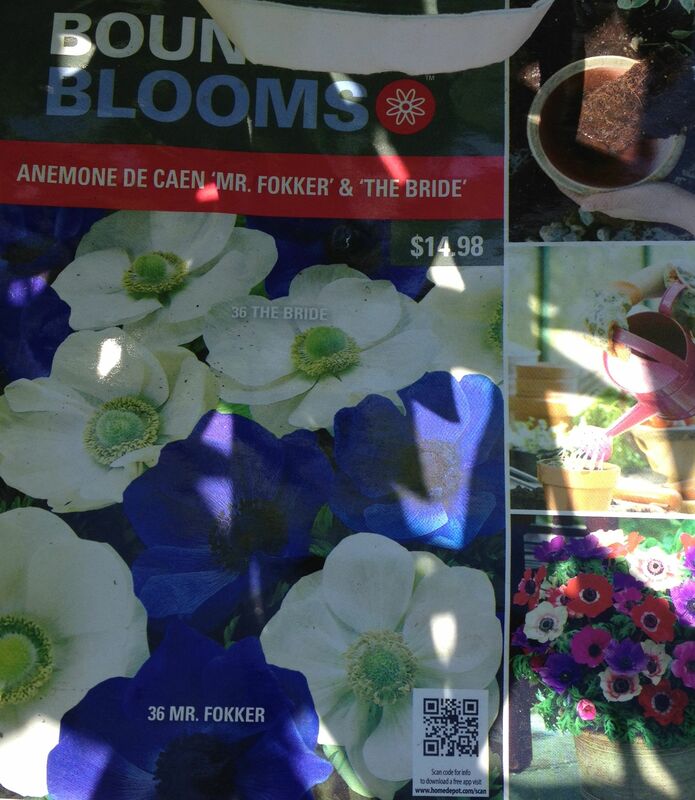 Too bad these are annuals; must remember to adopt early next summer. To completely fill up the space, I also added some cosmos “Sonata Carmine.” They’re looking a bit ragged from the mid-summer on-sale bin, but hopefully they’ll perk up and add some color towards the end of the season. What I’ve learned? Loving the hot colors: can’t have enough reds, oranges and magentas. Also, time to credit two sources: 1-a great online plant finder for the Latin names, and 2-KP for taking the photos. One achievement of a well-established garden is having a full, lush garden with constant interest throughout the season… or so that’s what my fantasy always said! I was looking for relief from feeling the need to have all the blank spaces filled with gorgeous foliage and color. Having always been on a budget, here are some of the ways I’ve been able to fill in spaces and provide interest without spending a bunch o’money. 1. 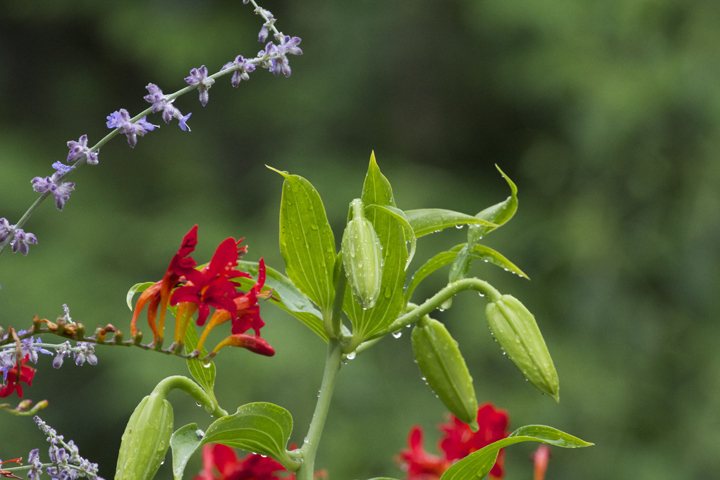 Growing from seed requires a bit more patience and planning. 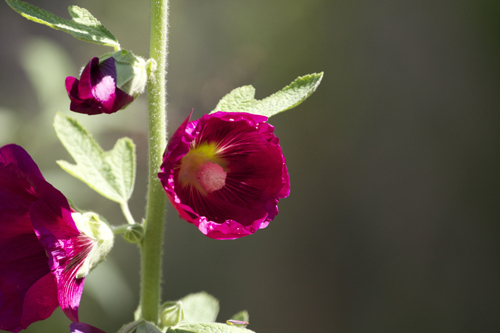 For example, here are the hollyhocks. I have ‘Nigra’; the other is a pretty pink (as pictured). Hollyhocks are biennial, and will bloom the second year only, in my experience. 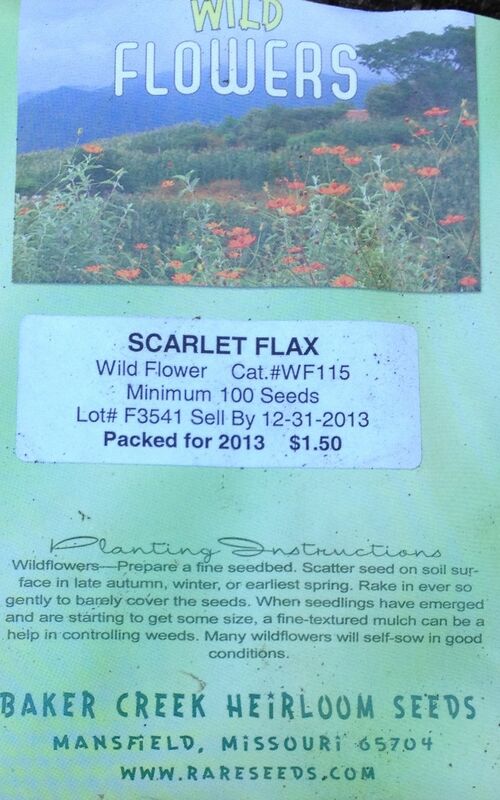 They self-seed, so after growing the first year, you can discard or move plant colors to a location that works for you. They are tall and well-behaved. These grew to be nearly 6’. I’ll let the seed heads dry out and then replant in another spot for blooms in 2015! 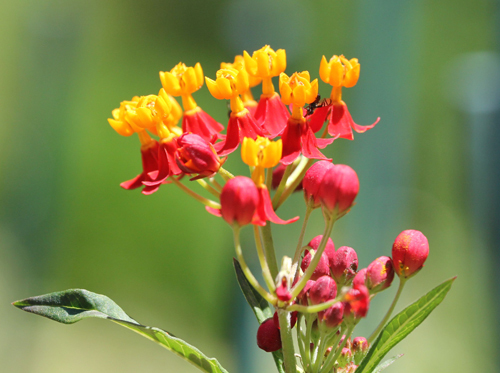 This is Asclepias curassavica or “red butterfly” which is taller than the other I have – Asclepias tuberosa. I let the plant die back and in the fall when the seed pods brown and split open, I replant the escaping seeds that have a winged feather attached to help disburse it. 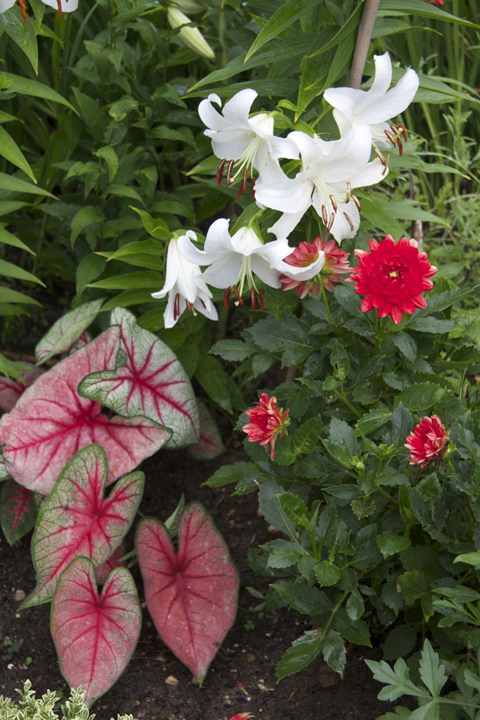 Once established, they’re perennial bloomers. 2. Another means is by purchasing packets of bulbs and tubers from places like HD. 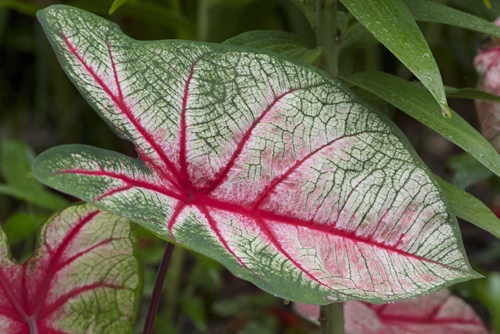 The caladium(s) (caladiae?) I planted earlier in the season are coming up. Very happy with how these are faring and will get more next year. The white and green ones would be especially nice. 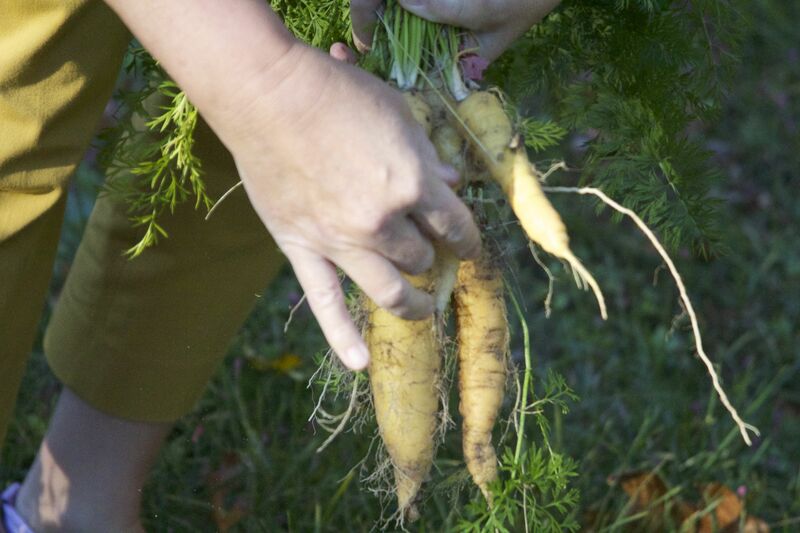 Inexpensive with in-season gratification for not a lot of cost or care. (P.S. 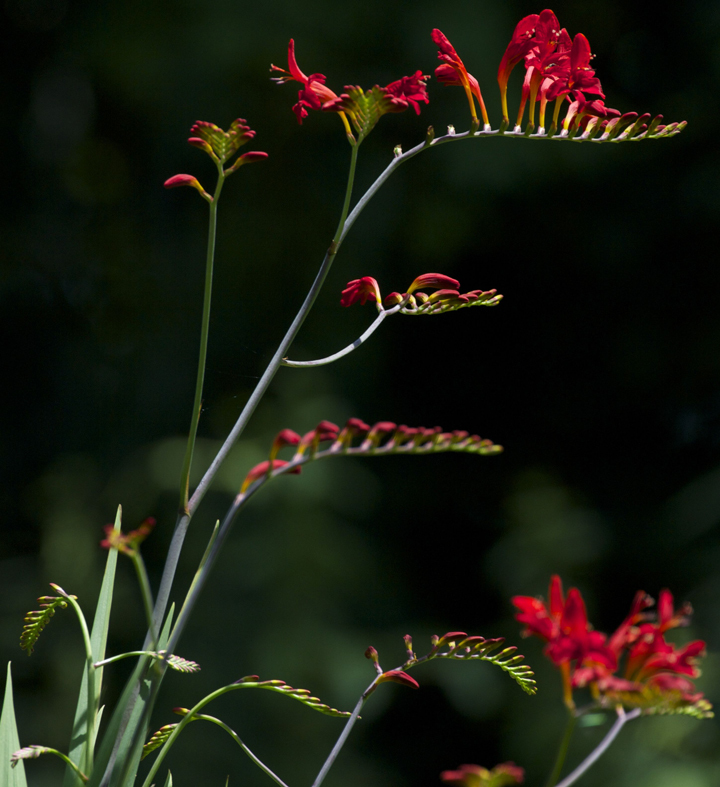 This is how I have also built up my crocosmia collection too. 3. 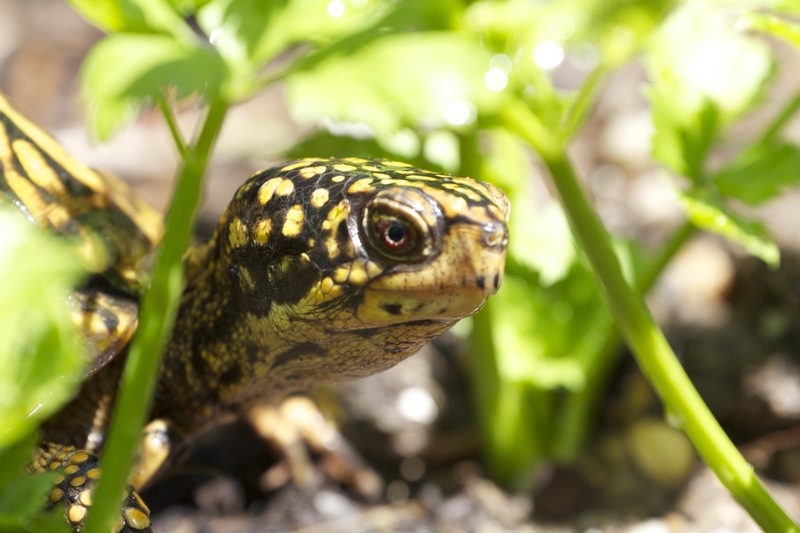 By trading with friends and neighbors, you can propagate many species. 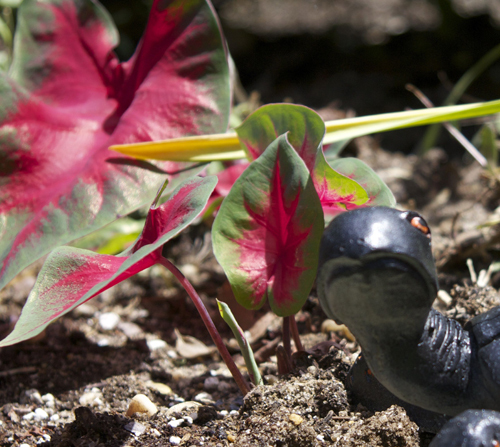 The gooseneck loosestrife were gifted from another’s garden… the friend of a neighbor, actually. 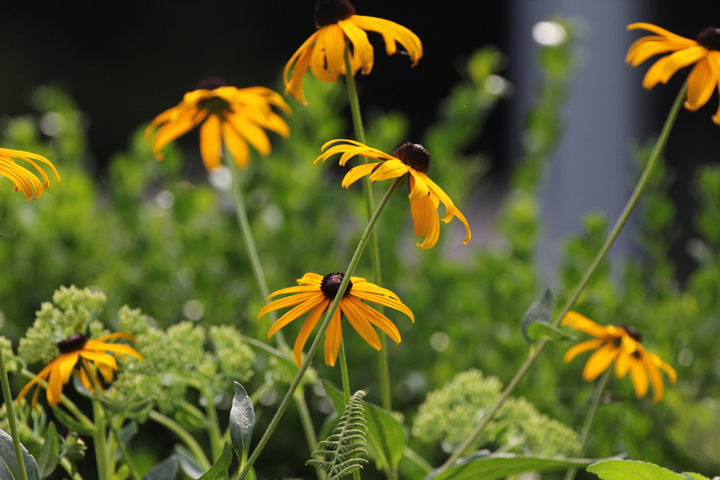 When in bloom and planted en masse, they are cheery and seem to bob their heads in unison when a breeze blows. 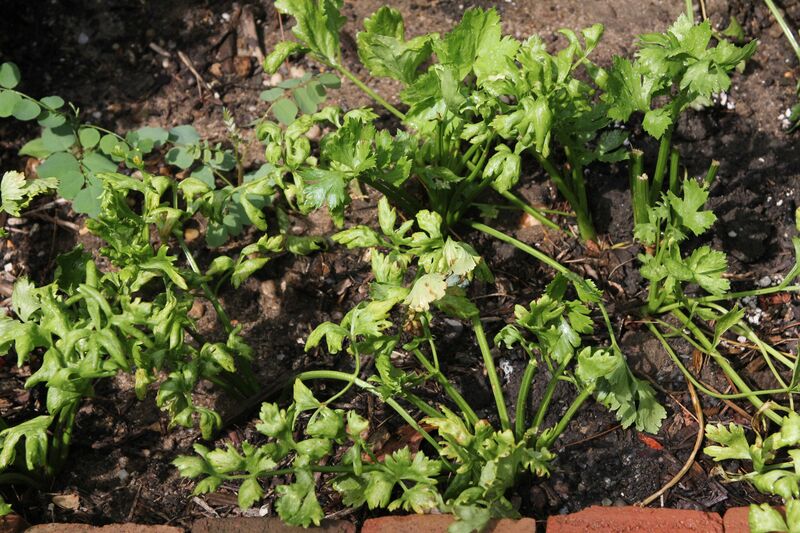 A caution about this plant: it propagates like crazy and can be hard to control as it sends tubers out and will sprout up in shrubs and other plants. Other plants I’ve received this way (and also shared in turn) are the irises that bloom in the spring: Two varieties from an aging neighbor who has now passed, and two smaller varieties from a dear artist friend. Hello again! It’s been awhile since I’ve posted. We went to South Africa for a couple of weeks in June, and our mutual employer has instituted some changes that have rocked our world, but the garden remains a tranquil anchor. 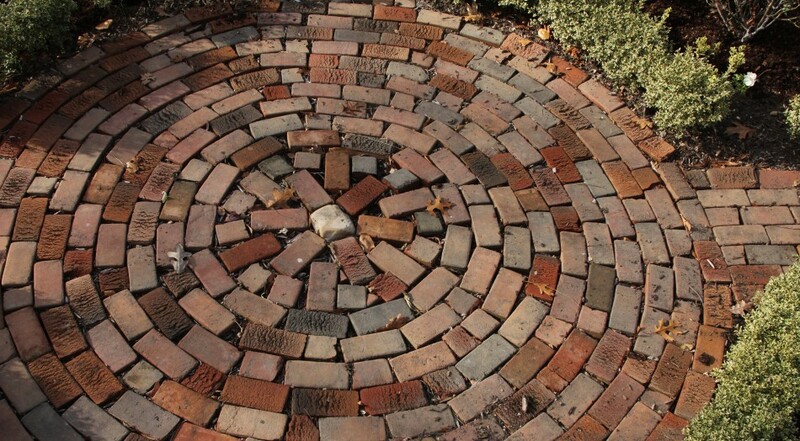 And what a riotous blast of color and texture one can experience at this time. Until I have some pictures and a new post ready, I thought I would share some thoughts on some visitors we have. Another visitor of late is Shadow kitty from a neighbor’s house. Not sure of its gender; KP thinks its a “he” while I think it looks like a “she”. A very timid creature and always looking a little tousled, Shadow waits for us to place a little food outside and very gingerly accepts the gift. Update! 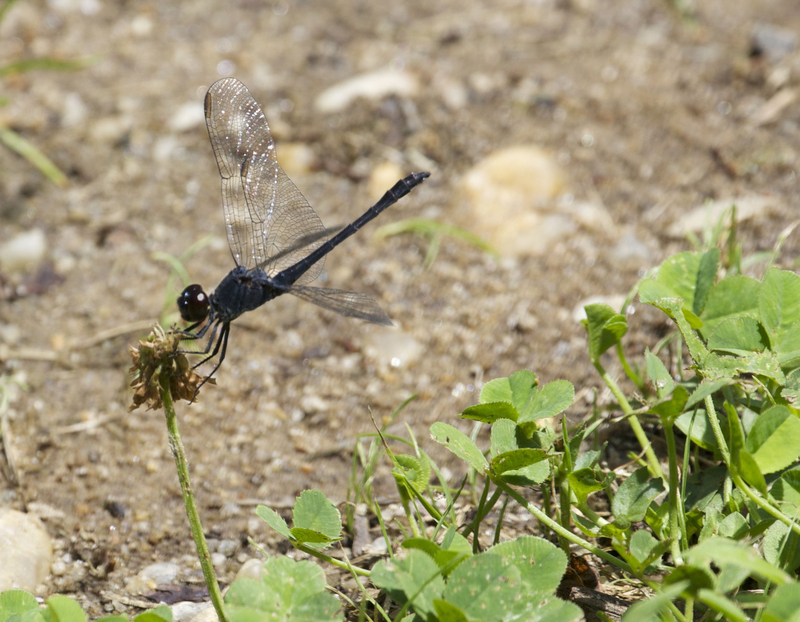 (July 28, 2013) We’ve seen civilizations of dragonflies this year, perhaps due to a wet early summer that launched a bunch of mozzies and nasty green flies. Thanks to the dragonflies, these pests have been controlled. 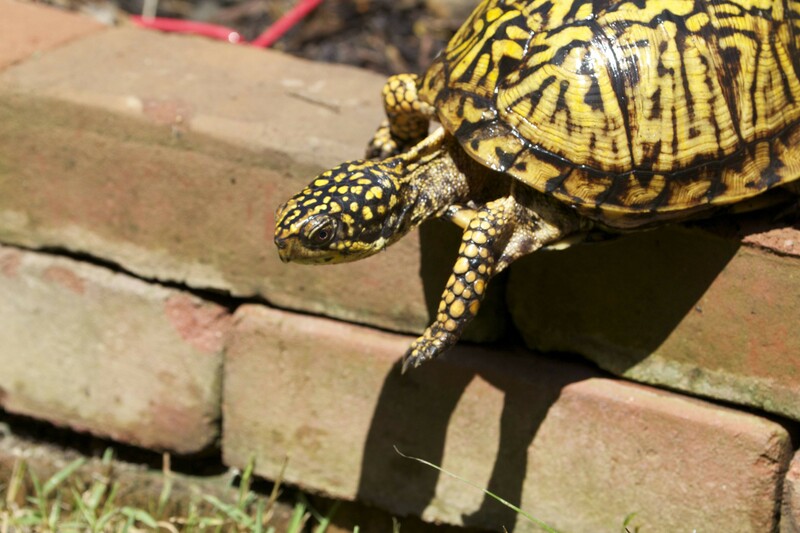 We love them for their pest control abilities and tend to idolize them architecturally. But it wasn’t until I read this post that my esteem was equalized by respect. In the garden, they appear to spend time resting (!) while holding onto a plant or lighting upon a surface. 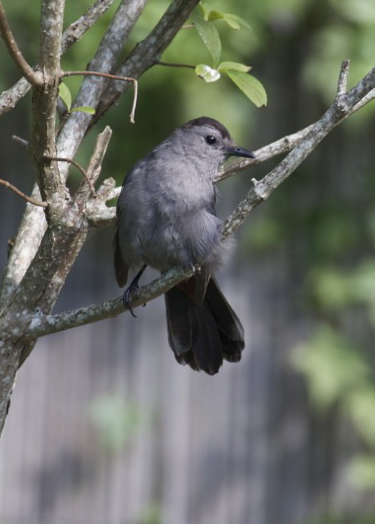 Once on a surface, their wings fold down as if in rest. 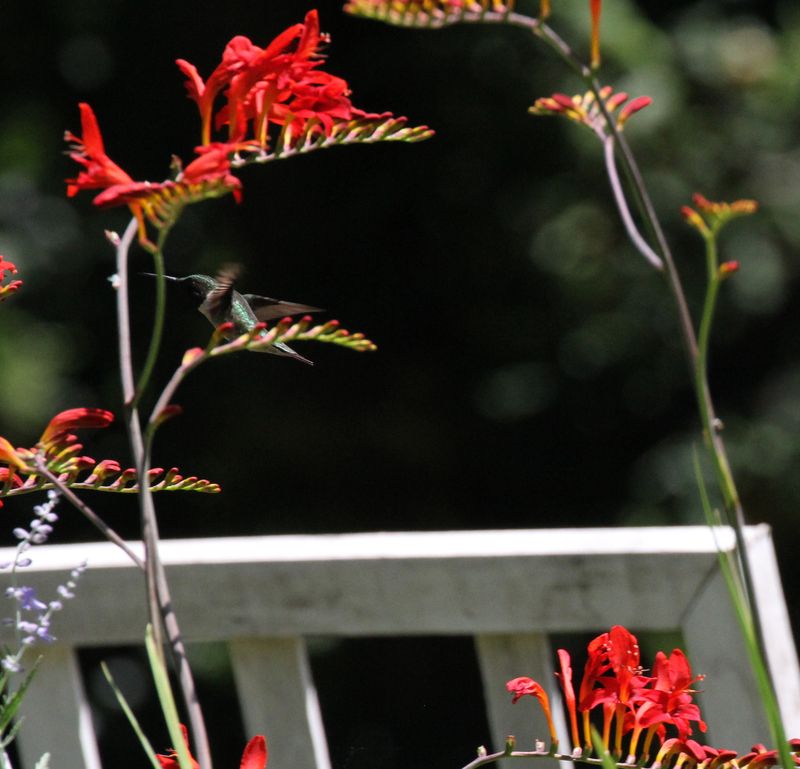 Oh, the illusive hummingbird! 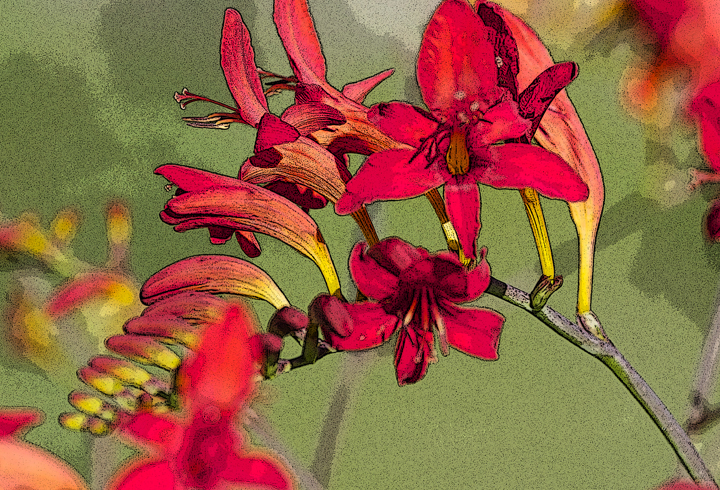 Always attracted to the crocosmia, they are ever so difficult to capture in photo. You can barely see it in this shot, but it is a gift to be relaxing and visited by these amazing creatures.